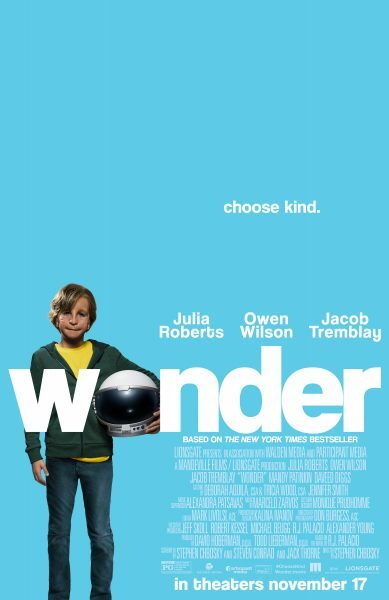 Just as the holidays approach and we are filled with gratitude for our loved ones comes a memorable movie, Wonder, for the entire family, that will transform the way we think about everyone who crosses our path. 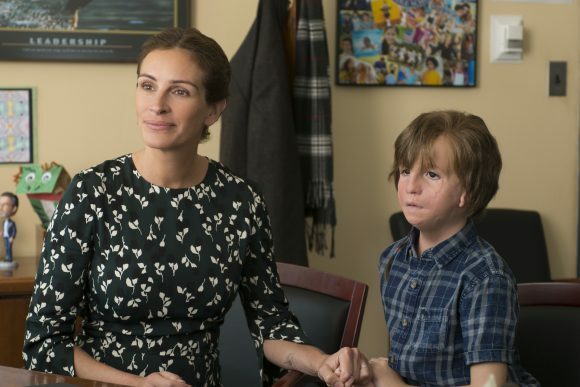 The inspiring movie, Wonder, based on the 2012 bestselling book of the same name by R.J. Palacio, is about a 10-year-old boy named August “Auggie” Pullman who was born with severe facial birth defects. As a result, he has needed subsequent multiple surgeries, which have kept him from attending school with his peers. He is happy at home, and comfortable with his close inner circle who accept him, embrace him, and refuse to judge his differences. Getting him out of his comfort zone and homeschooling environment, his mother, Isabel, decides it is time for Auggie to attend school for the 5th grade, leading him into unchartered territory on an unexpected journey. 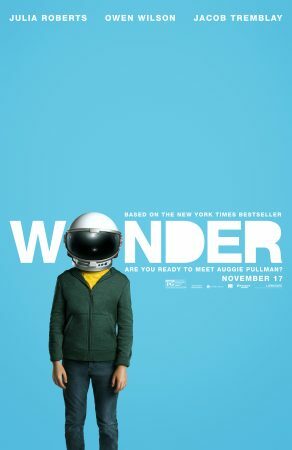 The highly emotional film, from Lionsgate, is about a brave boy, who has always wanted to be just an ordinary kid, but his teenage sister, Via, keeps reminding him that “you can’t be ordinary, when you were born to stand out.” This is a science-loving boy who once found solace inside a space helmet, who truly loves Halloween because he doesn’t stand out. But suddenly he faces a whole universe of gawking kids, who don’t yet know how to treat him. 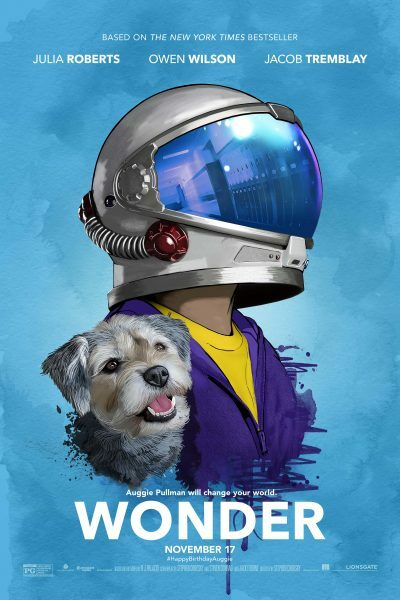 Played by 11-year-old Jacob Tremblay, best known for his stunning performance in the 2016 movie, Room, we instantly fall in love with Auggie, and embrace the important life lessons that his story teaches us. One day, some nine years ago, R.J. Palacio was in an ice cream parlor with her children, when they found themselves sitting next to a child who had a severe craniofacial difference, and their initial reaction was to look away. At the time, Palacio deeply regretted not engaging with the child, and began thinking about what it must be like to live every day facing a world that doesn’t know how to face you back. That was the inspiration for her book, and she started writing Wonder that same night. The novel is a riveting story, often tender and often raw. “I have always thought of Wonder as a meditation on kindness,” the author explained during a recent visit to Philadelphia. A graphic designer at the time, Palacio was uncertain that the book would ever get published, let alone find a wide audience. Since the 2012 publication of the book, which has been embraced by librarians, teachers, school children, and parents, Wonder has touched the lives of five million readers around the world. 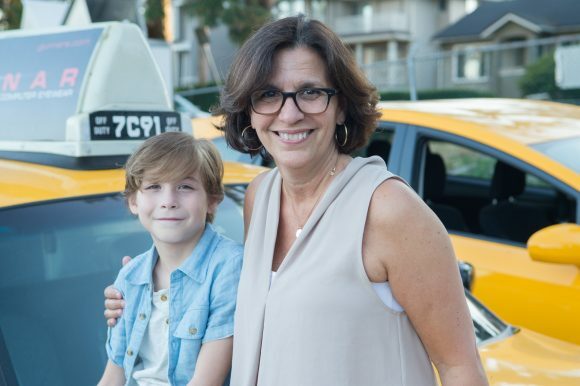 Jacob Tremblay and Author Raquel J Palacio on the set of WONDER. As the mother of an 11-year-old son with special needs, I have to tell you that I laughed a lot, but I also sobbed a lot, because I could identify with the mother of a child who was grappling with being left out because of his differences. R.J. PALACIO: I think there’s a term now that I’ve been hearing from a lot of moms of kids with any kind of special needs; they’re starting to refer to themselves as ‘Wonder Moms.’ Which I love. Why do you feel that your book, Wonder, and this story are so identifiable? R.J.: I think the story, whether you have a child with special needs or any child; anybody with a child understands that sort of knee-jerk need that every parent has that they want to make sure that the world is a good place for their kids. They want to make sure that the world is kind to their children; that’s what we all hope for and pray for every day when you send them off to school. I think that’s a really universal theme that everyone can tap into as a parent, and I do think parents read Wonder and watch the movie on one level, while their kids will see it on a completely different level. It is quite staggering to consider that more than five million people have read your words and now millions are going to see a movie based on your ideas. What does that feel like? R.J.: It’s amazing, humbling and mind-blowing. I can’t even find the right words to describe it. When I was writing it I wasn’t even entirely sure it would get published, and once it did I expected it to follow the usual trajectory of 99 percent of the books that are published, which find a little market and then it disappear. So, everything that’s happened since then has just been like blessing after blessing, and the fact that five million people around the world have read it and been moved by it, and more will be because of the movie, is hard to describe in words. Talk about Julia Roberts, what does she bring to this story? Julia Roberts as “Isabel” and Owen Wilson as “Nate” in WONDER. Photo by Dale Robinette. R.J.: Yes, and then to round it out with Mandy Patinkin as [the school’s principal] Mr. Tushman, who’s also incredible, Daveed Diggs as Auggie’s teacher Mr. Browne, and Izabela Vidovic, who plays his sister Via. Tell me what you saw taking place on the set of Wonder, when you were there. R.J.: When I visited the set, it was the very first movie set I’d ever been to and I was, frankly, astonished at how many people in the cast and the crew would come up to me and just talk about what a special place this was. 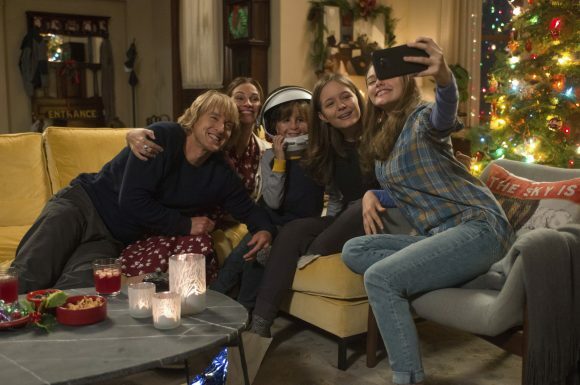 From L to R: Owen Wilson as “Nate,” Julia Roberts as “Isabel,” Jacob Tremblay as “Auggie,” Izabela Vidovic as “Via” and Danielle Rose Russell as “Miranda” in WONDER. Photo by Dale Robinette. What did they say that you recall? RJ: They told me that there was a sense of kindness and benevolence on the set and they would say, ‘it’s Stephen, it’s just like this trickled down kindness that’s happening from above.’ There was never any shouting on the set, the kids followed him around like he was the Pied Piper, he knows how to talk to kids. R.J.: There’s no one like [the character] Summer there for him. But he’s different, and every parent of a special needs child wishes that they would go to school one day and fit in and blend in, in the same way that Auggie wishes that he could, but sometimes it’s hard. R.J.: I’ve always thought that things like compassion and empathy and tolerance; those are really hard to teach. You can’t sort of program kids to feel these things, but you can try to inspire them through good stories and through relatable characters. I love how the book gives its due to the underdog, because you want that for Auggie. R.J.: Yes, we all want him to have his moment in the sun. So, do people get different life lessons, different messages from the book, especially with all the violence and chaos going on around us? R.J.: Especially now, oh my goodness, yes. How do you make people laugh and cry at the same time? R.J.: That’s always been one of my favorite emotions, laughing-crying; it’s to me like one emotion, and my favorite movies and my favorite books have always been books that are able to make me toggle back and forth between feeling a wide range of emotions. I tried to be as realistic as possible with the situations, and I think when you’re writing from sort of trying to go to a real place, the situations themselves present themselves, just like life does, with many funny moments, even at the worst times. RJ: For me, the idea that during the worst day of Isabelle and Nate’s life, was in a way, the best day of their life. When Auggie was born, they didn’t know he was going to come out looking the way he did, and yet he was, and yet in that scene introducing a farting nurse was kind of funny. It’s kind of like a horrible situation and yet there’s that element that you can only kind of laugh at despite the horrible circumstances. I think that’s being a human being, sort of appreciating the fact that in any moment there’s levity, and in any moment, you can be on the verge of tears. I’ve been telling people who ask if I like the movie to go see it, and to be prepared to laugh a lot, and to cry a lot. So, tell me, since this has been quite a journey for you — how does your family feel about the book? That must have warmed your heart. RJ: Yes. After that, several people have said the same thing to me, but it meant a lot to me coming from him. My younger son was only seven-years-old when I read it to him for the first time, and he left me a little Post-It, which I still have on top of the book that I read to him, and it says, ‘I love Wonder and I love you,’ in his little hand writing. R.J.: It was so sweet. R.J.: I’m working on a graphic novel right now that will probably be the next thing that’s out. R.J.: I wrote a book called Auggie and Me, which has more of the Wonder stories. One of the chapter’s is from Julian’s point of view, and it’s called the Julian Chapter, and in the Julian Chapter, his grandmother is the voice of reason, and the person who finally gets through to him by telling him a story about herself that happened when she was 13 years old, a young Jewish girl in the time of the occupation in France. RJ: I thought it was really important, given the times we’re living in, to remind people of the George Santayana quote, ‘If we don’t remember the past, we’re condemned to relive it.’ So, I feel that now, more than ever, that kids need to be reminded about being upstanders, not bystanders. Wonder and the subsequent stories are spreading your vital message of acceptance, kindness, and compassion, and finding out who you want to be. RJ; Yes, for me it is about creating and telling stories that inspire kids to have the courage to take a stand against things that they find are wrong, whether it’s taking a stand to protect somebody who’s being bullied, or taking a stand to protect a group of people who are being persecuted. I see a common thread in your writing. RJ: Yes. For me, it’s about showing your true character. Wonder is now playing in theaters after opening on November 17, 2017. You can also ready Debra Wallace’s follow up article about Wonder with an interview from Wonder director Stephen Chbosky and Debra’s Wonder movie review in this article, The Wonder Movie Teaches Us That Kindness Counts. Need help selecting family-friendly movies? 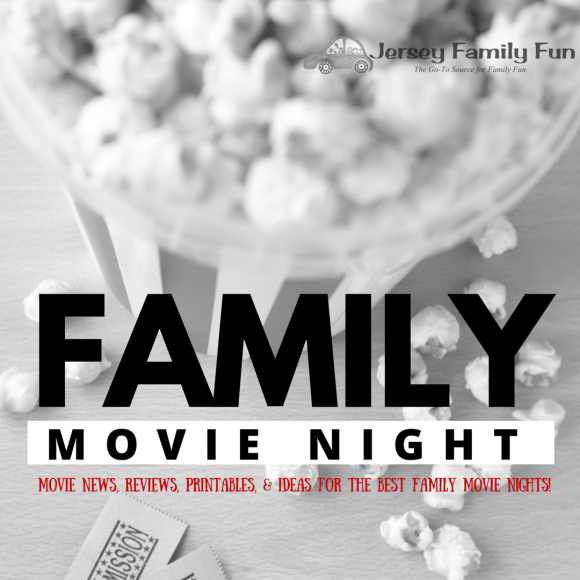 Visit Jersey Family Fun’sFamily Movie Reviews series. 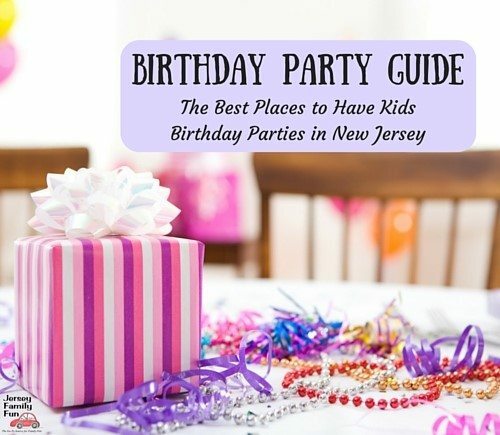 Want to plan a fun family movie night? Visit our Family Movie Night series.